You wouldn't know it going by the press or even the RFUW website, but this summer is going to feature an awful lot of international women's rugby, including the largest and most prestigious tournament ever held in England. In fact so much rugby is to be played that the leading English players will have a summer "break" lasting barely two weeks (if that). One reason for this was the decision to include a women's competition at the 2009 Rugby Sevens World Cup. Sevens is bit of a sideshow in the men's game, but for women's international rugby it isn't just big, its huge! In many countries the only version of rugby that women play is sevens. Take, for instance, the recent FIRA European (XVs) championship - that featured 15 counties, out of maybe 18 who could have realistically entered. The equivalent Sevens tournament, due to be played in Limoges, France on 14th/15th June, has had so many entrants - 34 in fact - that FIRA have had to organise two qualifying events, the second of which will take place this weekend in Belgium. The first qualifier was held in Bosnia a couple of weeks ago and saw Romania, Finland and Israel win through to join three teams from this weekend's event, plus France, England, Spain, Wales, Italy, Netherlands, Sweden, Russia, Portugal, and Scotland. The top six from that will then go to Dubai next year. And across the world it is the same. While around 80 different nations have competed in major women's sevens tournaments in the past four or five years, only just over half that number have played even one XV-a-side test. So how are England doing at sevens? The answer seems to be pretty well so far. England have never failed to reach the final of any European championship that they have entered (ie. the last three), though they have only won it once (in 2005), losing to Wales in 2006 and France last year. But in recent weeks England have begun to step up a gear and have beaten New Zealand "Aotearoa Maori" (effectively the full New Zealand team) twice in a fortnight, a significant performance considering that the New Zealanders had only previously lost one sevens match... ever! This weekend, as a warm-up for Limoges, England will be taking part in a Home Nations sevens in Edinburgh where they will take on Wales and Scotland (Ireland do not seem to do Sevens). After the Limoges event, on 7th August England are due in South Africa for a massive sevens tournament featuring South Africa, Canada, France, Australia, USA, New Zealand, Samoa, Wales, Uganda, Rwanda, Kenya, Morocco, Zimbabwe, Tunisia and Zambia - a mini World Cup, in effect. Then a week or so later - on 16th August - begins perhaps the highlight of the summer, especially for those of us in England, as we are due to host a XVs competition (the Nation's Cup) that most sources say will feature England, USA, Canada, Wales and France - five of the top six (XV-a-side) nations in the world. No details about the event have been published so who will play who where and when is anyone's guess - but this (apparently annual) event will be well worth trying to see as it does make the Six Nations look like a bit of a sideshow. And the following week... well, the 2008/9 season begins. Rugby for elite women is now a full-time occupation! Dave Sharp wil be giving away free beer (and no doubt some non-alcoholic refreshments) and a barbeque on Saurday 14th June. Okay, there is a slight catch in that the above generosity will be limited to those who put in a bit of work on the car park on that morning/afternoon (starting at 9am, but late comers will not be turned away!). No indication as to when it will all finish - I guess whenever the job is done! Campaigning for women's and girls' sport. The Women' Sport and Fitness Foundation is an organisation campaigning for women's and girls' sport. They are running a number of campaigns, including a campaign to improve media coverage of women's and girls' sport that anyone can get involved in (if you want an example of what to complain about take a look at the BBC Sport rugby webpage - no mention of England's recent European Championship win, or come to that the impressive performances of Wales and Ireland). In addition they also have a monthly newsletter which frequently includes rugby. The latest issue includes an interview with Clive Woodward while the previous issue headlined an article from Katie Storie about A day in the life of an England Women's Rugby Player. Copies of the former quarterly magazine can also be found, and again rugby features - the Spring 2007 issue in particular includes an article on the game which includes an interview with one of Saracens' girls. It can be a bit downbeat at times when it covers how hard it is for girls to play sport compared with boys - for example "Did you know that 23% of women agree that PE at school put them off doing sport." - but at least this is an organisation that is trying to do something, all be it on a shoestring, and as such is well worth supporting. Now the dust has settled from the playing season we can look forward to our "traditional" sporting get-together that its Herts Superteams. Several of you were very enthusiastic about this when it was mentioned last week (Jess for one) but we need to begin to sort out who will be in the two teams. Mike Alcock is co-ordinating the entries this year - please drop him a line if you are in any way interested. As places are limited the sooner you get in touch the better! Finding posts that have previously appeared on here can be a bit fiddly. You know that there was something on here about a particular player, or match but it takes ages to find it. To help with this at the top of the column on the right you will now see a "gadget" that will allow you to search for any information that has appeared on this blog. To make it even more useful it also searches the main club website, the Threlfall photo archive (ie. those pictures with captions), as well as the county and regional blogs. Let me know what you think. It is possible to easily add or remove sites from the search - though the potential value of the gadget will be its narrow focus. Having got well and truly stuck in traffic in Dunstable on the way to the National 7s last year, we made a point of getting away early and travelling by a more northerly route which, of course, meant that this year we arrived half an hour before registration was due to start. It seemed like an age waiting to see the draw and discover who our opponents would be and it was nail-biting stuff ... last year we had been grouped with Worcester, the eventual winners, and a very lively Reading team who had confined us to the Plate competition. This year surely we would be luckier ..... when the draw came we found that we had been grouped with Tynedale and, of course, Worcester again! However, the fourth member of the group had withdrawn so the remaining 3 teams were chasing two places in the cup competition. Our first encounter was with Worcester and things did not start too well - Nikki's drop-out was collected by a Worcester back who accelerated past the entire Letchworth team to score. The game then settled down to a well contested affair and we turned round at half-time trailing by only 2 tries and, with the quite noticeable slope in our favour for the second half, we were hopeful of making inroads into that lead. But the second half started almost as badly as the first had done and Letchworth conceded a try early on. This was followed by even worse as Sasha managed to collide with a Worcester player mouth to head and Sasha's mouth - or, more precisely, her tooth - came off worse. With a badly broken incisor, Sasha was forced to retire from the tournament which was very unfortunate for her and her teammates. The game resumed with Worcester clearly in control with a 4 try lead and, despite spirited performances from the Letchworth girls, Worcester ran in a couple more tries for a 40-0 victory. Having lost the first game by a big margin, Letchworth knew that an outright victory was essential to see them into the cup competition and they came out for the match with Tynedale in a positive frame of mind. It wasn't long before Hayley stormed through for a try under the posts which Nikki converted via the crossbar. Letchworth seemed to be in full control when Hayley crossed for a second try out wide but Tynedale fought back well to get a try before the interval. After the break, Randy sprinted through to increase the Letchworth lead and also converted the effort herself. At 19-5, the game was secure ... but Tynedale didn't quite see it that way! In the last minute Tynedale broke throught the Letchworth lines to score a try and convert it leaving themselves just 7 points adrift as they restarted the game with only 20 seconds left. The restart bounced uncomfortably down the pitch towards the Letchworth try line evading several attempts at capture before, finally, Carla secured it and the game for Letchworth. Four Tynedale defenders between Hayley and her ultimate goal - the loo! Having finished in runners-up spot in group A, Letchworth were scheduled to meet the winners of group B in the quarter-final but, with three teams tying on points in that group, it took some time to establish that, on the basis of a superior points difference, our opponents would be Basford. Again, Letchworth conceded a try early on when the referee's call of 'advantage yellow' was misinterpreted by Letchworth to mean their advantage and Basford drove through to score. Letchworth fought back strongly but were repeatedly thwarted by foul play - the referee awarding countless penalties in their favour - and were unable to make the vital score. Basford, meanwhile, notched up another try before the interval to put more pressure on the Letchworth girls. The second half was very keenly contested with Letchworth attacking strongly throughout, but it was Basford who broke away to score again and put the game beyond Letchworth before the teams traded tries on the final minutes. So Letchworth girls ended the day as beaten cup quarter-finalists - the best they have ever achieved at the National 7s. Well done, girls! However, it really did feel like a most peculiar day : we were at the tournament for 6 hours to play just 3 matches! Being in a group of 3 rather than 4 teams obviously gives a better chance of getting through to the cup competition but it also turned the day into a long drawn out trio on individual matches rather than a tournament - the exact opposite of the ridiculous rush of the National 10s where we were being told to line up for the start of the next game before the players had even finished the handshakes of the current one! Somewhere between these two schedules lies sanity. And, finally, many congratulations to Exeter Saracens and Wimbourne U18s! You remember the Nationals 10s at Lichfield? Remember that (once it was agreed which day it was!) it was supposed to be a day for senior and junior clubs? And that for some reason there were no senior clubs? I think I have found out why... see below. Seems it isn't just junior teams that get a bit irate with what I will diplomatically call "life" sometimes. As a stream of justifiable invective its pretty damn brilliant actually. "Did you hear the one about a load of England's biggest teams deciding to pull out of the RFUW's National 10s tournament? That's it! There's no punch line. For some reason Saracens, Wasps, Vale of Lune and A N Other decided that having qualified for the National tournament on the 4th May at Lichfield there was no need for them to honour their National Governing Body, the other two sides that had won through to the finals legitimately and indeed the other teams that had attended the respective regional 10s competitions and lost out from progressing at the hands of these teams. Were they suffering from a loss of players to Super League? Did they have substantial injuries and absences after a long hard season? Did the same injuries and absences affect the other two teams that were due (AND COMMITTED) to play Sunday (Cheltenham and Camp Hill)? Did they feel that any of these reasons plus any number of "others" might subject them to an unfair advantage and heaven forbid they lose to a team beneath them? Do some of these teams not have second teams? Could they not have found 12 players, any 12 players? Might they have been weaker than National Championship One sides for having to supplement their "normal" team with second stringers? If so, so what? Its called "taking the rough with the smooth." I for one would like to know what the RFUW plans to do about this, not only for Cheltenham and Camp Hill, but for the 3rd and 4th placed teams from those affected regional competitions that could have been at a National event had these teams been courteous enough to advise everyone of their intentions or even the risks they faced with potential absences or injuries. They have denied other teams, lower ranked teams that could have learnt a massive amount from playing on a national stage, earnt some good coverage too, from having a go. There is no excuse for 4 of some of the country's biggest teams pulling out - they have a responsibility as do we all to fulfil their fixtures; if teams do not fulfil their fixtures in the league environment they can be relegated - well RFUW National 10s, 7s whatever, these aren't friendlies, these aren't substitute a player for someone dressed as a horse festivals, yet these teams have felt they are able to abuse their positions perhaps and treat the occasion as something they can choose to attend. My suggestion is these teams are heavily and publicly reprimanded, yet there is nothing (or at least wasn't anything when I posted this) on the website…at all! Why haven't the RFUW lambasted these teams and appointed some sort of financial penalty as well as a 1yr ban for these 4 teams from attending next years competition. The RFUW should protect the interests of the game and ethos of competition. They should stamp their authority on the game and not allow the big name teams to do as they please. Please, please bring some common sense into the governance of the game and facilitate some preservation for those teams not best blessed with a Men's Premiership name, who have to fight tooth and nail for everything and who get the raw end of the deal when the top name teams continue to rule the roost (whatever those that belong to these teams might think this happens)!!! In addition the RFUW don't escape unscathed - why have they not made any attempt to reschedule the event (if they are planning to why hasn't this been communicated) - they could have invited those teams that finished 3rd and 4th from the respective regions to attend, if they had have declined they could have asked the 5th placed team....make it happen, obstacles can be circumnavigated with a little effort!! The author does not give their name, or club (and isn't it sad that people making quite justifable complaints feel they need to remain anonymous?). I have seen no explanations for what happened anywhere - I only hope some action was taken. Anyone know? There is also a wonderful irony here in that a couple of years ago the Big Teams were complaining about how the smaller clubs always pulled out of the seniors National Cup. ... or a Highland fling, perhaps? Sisters together... for the last time. ...isn't there some sort of law against stripping your opponents? The RFUW Regional Conference will be at Hatfield on 28th June. A full day of practical demonstrations, discussions and case studies aimed at players, coaches, referees and managers. There is even a Q&A session where you can get a chance to ask RFUW board exactly what they are doing. All in all it really is well worth going - I went to one a couple of years ago and it was excellent. In theory we can send up to two people, but in practice I suspect we could send more. Trouble is that at the minute I am not aware that we are sending anyone. RFUW are asking if clubs can put forward delegates by the end of this week. Though I imagine they will extend that if need be (after all they let clubs take part in competitions even if their entries are well after the deadline...) it would be nice if we could get one or two names to them before the date. There's a bit more information on the RFUW website (plus an application form). If you are interested please let me or Mike know - you do not have to be a club "official" to benefit from the day! End of Season : Party time! After the rigours of a long season that started some 9 months ago (and involved 41 games! ), it is good to relax at an 'End of season' barbecue party as the players, parents, friends and coaches of the Letchworth girls teams found on Saturday evening. It was very gratifying to see that the usual high standards of sartorial elegance were not allowed to slip just because the season was over .... were they, John? Oh well, we all had a great time anyway! Letchworth Garden City RFC U18 Girls, coaches and supporters at the RFUW National 7s, Leighton Buzzard RFC, where the team reached the cup quarter-finals for the first time. Many thanks to Lizelle for kindly taking the photo for us. 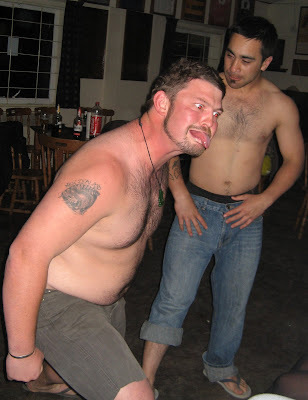 The compulsory embarrasing photograph - from the Hemel Girls' Tag Festival in 2004, the forerunner of Herts Sevens. The first of the "true originals" is moving on the greater things. Practically an ever-present at scrum-half for four years (who will do that job now? ), Katie was one of a handful of girls who have been there for everything since the very, very begining - the legendary tag tournament at Herts Youth Games in 2004. In fact she was only a reserve for that. The team was a joint affair with Hitchin - five girls were selected by each club, and Katie was our sixth. When one of the Hitchin girls failed to show up, urgent phone calls from the touchline had Katie and Mike rushing to Hatfield in time for the second game. They've been there ever since. When September 2004 came round Katie was at the centre of the new team - indeed she was the entire U17 team for the first few weeks! Fortunately in those dim and distant days the writ of Twickenham did not run too strongly in the shires, and most clubs took a suitably Nelsonian approach to annoying little administrative details like birthdates, so almost all of our first season's games were all-in affairs. If that had not been the case, would Katie still be playing today? They were innocent days when the idea that a bunch of girls with little or no playing experience could be match ready in six weeks did not seem unlikely, or that they should win their first three games not impossible. We were all learning together - we didn't know any better. Could that be done today, I wonder? One of Katie claims to fame from that first season is that she was the first, and only, girl injured during the season (ie. injured enough to miss the following week's game) - until we got to the National Sevens of course! Ironically it happened in one of the very few age group games - against Welwyn - after which she was diagnosed with concussion. Come to think of it, ALL our injuries that season came in games with strict age-group limits! As scrum-half Katie has always been more than just a starter of moves - her speed of reaction and vision have ensured that she has finished a fair few as well. Her pick-ups and runs down the blind-side of scrums have brought us tries from the very first game, and have included some of the more important scores in the team's history - perhaps above all the winner in the Rochford 10s in 2006. But it as an advocate of girls rugby, and as a captain, that she will perhaps be most hard to replace. Katie has been a superb captain for the past two years and - thanks to the internet - her famous speech at the RFU President's XV awards has been copied around the world (moreover a speech largely off-the-cuff and without notes). If in the future the RFUW are looking for someone to spread the word about women's and girls' rugby, someone who could really sell the game to ordinary girls (and parents! ), they should look no further. We are all together now because of Katie and the other originals. Together we have created something pretty special, as we all discovered last night. A true rugby team made up of friends from all backgrounds, open to anyone who wants to play, that is capable of holding its own (and more!) against the best in the country without the need to hand-select players from all parts of the compass. We have girls choosing their higher education courses - even careers - based on what they have experienced here. Katie, you have helped change people's lives. There can be no higher tribute. The season has not finished for two players as the good news has come through that Hayley and Sasha have both been selected for the summer's HPAs - the first step in the selection process for the U18 "TDGs" - the elite training group for the best 30 girls in the country. With many of the existing TDGs moving out of age band this year both girls must stand a good chance of returning (in Sasha's case) or finally achieving selection (for Hayley). In the latter case its always been a problem that Hayley has not quite shown what she could do at a trial as she tends to be a bit too relaxed - so if someone could please arrange to get her a bit annoyed before the trial (doesn't matter too much about what) we can arrange to point her in the right direction... and stand well back. Also a few foreign language lessons, with a particular emphasis on expletives, would also no go amiss. We've been here before. Just over a year ago we thought we were saying goodbye to our flying wing, but she came back and has even played in majority of our games this year. However this time its not the army but age that has caught up with her - and there is no weekend's leave from that! What more is there to add to the earlier tribute, beyond the fact that Randy returned to us this season quite staggeringly (embarrassingly for everyone else!) fit , and - incredibly - at least a yard or two faster? 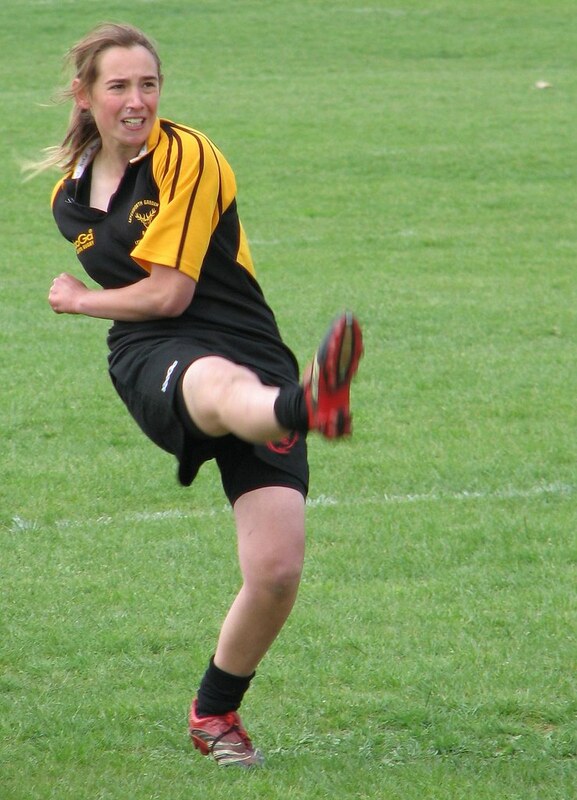 As a result she's picked up a whole heap of tries this season, and had a very good sevens season to round things off. What is more her future rugby career seems assured as by her return Randy was already a fixture in her corps team - and comfortably the youngest player as well. In fact we learn that the fastest feet in Letchworth are off to Germany for three or four years, so may see very little of her. Remember to keep in touch, Randy. And for our German readers (and there are a few!) it may be worth noting that one of the best wings we've ever produced may be at a British Army camp near you soon... and looking for a game! Reports to follow shortly. Suffice to say it was our best ever performance, but there are some more important matters to deal with first. Superteams 2008 - its ON after all!! Our little "fundraiser" (ie. we do tend to pick up the awards at this, and the prizes are of a financial nature) - Herts Superteams - is ON after all. Fears that it had been replaced with the new Sportshall event have proved groundless now as I have received details for the 2008 event. The competition will be on Sunday 13th July, 10.30 to 4.00, at Hatfield Sports Village. There is a list of events, but I'll take that with a pinch of salt as it has never proved accurate in the past. Suffice to say that I'd expect that all the usual events will be there, is. basketball, hockey, gym tests, obstacle course, etc. Teams of four - age on the day - in two age bands, 11-13 and 14-17, and we can enter two teams. It does say that teams be mixed, so we may need the help of some "token males" if anyone can unearth some - though that is not necessarily a show-stopper. If you've been in this before then you'll know what fun it is. If you haven't - don't miss out this time! Closing date for entries is 29th June - if you are available please let me or Mike know asap. I've just realised. Unless I am mistaken, the result on Sunday against Kettering was the largest win - certainly the largest margin of victory - we have ever attained in any match of any sort. In addition, I think, its the first time we have broken throgh 50 points - even if it isn't it is definately the first time we have kept a clean sheet doing so. The very first game we ever played - against Milton Keynes in 2005 - finished about 42-12 and was, I thought, still pretty much our best result. Last season's home game with Saracens and some of the Ampthill meetings may have been fairly close - but in all of those we did conceed points as well. Hence my near certainty that last Sunday was a new record! But before I get too wrapped up in the U18s tournament I'd like to spend a short while discussing the U15s where Laura Wennington played for the Herts Barbarians team who were drawn in a group with Basford and Tamworth. As is usual on such occasions, the Barbarians were players from different clubs (who did not have enough players to enter a team of their own) and were put together on the day to form a team for the tournament. Although many of the players didn't know each other before the games started, they worked really hard together and, after a heavy defeat (39-0) to Basford in the first game, they beat Tamworth 31-5 to finish second in their group. This secured them a place in the Plate competition where they met Kettering in the semi-final. Kettering put on a fine display to secure their place in the Plate final, while Herts Barbarians went on to play Hertford in the third place play-off for the Plate. Despite a spirited performance the Herts Barbarians went down 26-5 giving them 8th place overall in the U15s tournament - a very creditable performance for a team introduced to each other only 30 minutes before they played!! The Letchworth U18s started very badly - Richard's car broke down in Letchworth with two players on board! By the time I had unloaded my car at Tabard and made the round trip to collect them, the first game against Pavworth Maoris had already finished. However, it was good news that greeted our arrival - the Letchworth girls had played really well to win the game 25-0 and we were in time for the second game against Kettering. Just as sometimes everything one tries goes wrong, so the Kettering game was one of those when (almost) everything Letchworth tried went well. The 'almost' refers to a wonderful tackle from Georgie which unfortunately resulted in a very swollen ankle and Georgie being forced to watch the rest of the tournament from the sidelines. Despite this, the team ran in 9 tries to win that match 55-0 and so they entered the final group match against Bucks Jesters full of confidence. The first half was the 'Randy show' - 3 tries and one conversion from her saw Letchworth in a commanding position at half-time but, early in the second half, Hayley saw red and was promptly despatched to watch the rest of the tournament from the sidelines. The remaining 6 bravely fought on to secure the game 22-12 and thereby to win first place in the group. And so to the knock-out stages of the competition with a semi-final against Wisbech Grammar school who had beaten Herts Swifts and Reading in their group. The match was another excellent display by the Letchworth girls who notched up 6 tries to earn a place in their first Cup Final of the season. The opponents were Basford who had won their semifinal with a convincing 30-0 victory over Bucks Jesters. Unfortunately, the final was not to be a happy finale for Letchworth. Having conceded a trio of tries very early on, it was always going to be an uphill struggle and, even though Katie scored a try shortly after the break, and all the Letchworth girls gave everything they could, it was Basford who ran out winners by 8 tries to 1. Overall, second place in the Herts 7s is something all the players should be immensly proud of. I'm certainly proud of you and I know the coaches are too. Well done, girls! Taken any good photos recently?